Every hockey team wants a great goalie. But the truth is if the rest of the team is good enough you don’t even need a goalie. Keep the puck at the other end of the ice and the goalie spends the whole game standing there bored. He’s a last resort when your game plan fails. 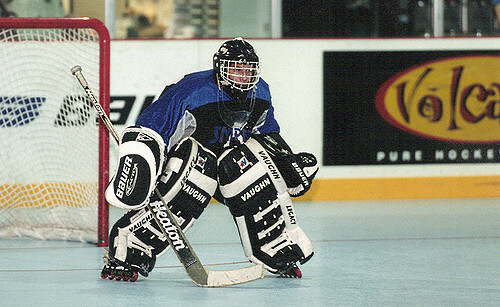 When you’re trying to change a habit, willpower is your goalie. You want to be able to block all the temptations coming your way, but face enough shots and some are bound to get through. The problem with dieting — well … one of the problems — is that you can spend tons of effort resisting, then one moment of weakness and it’s like you haven’t even tried. When you’re studying for finals you ignore incoming text messages for hours. Eventually you give in and check to see what everyone is up to — huh, they’re studying for finals too. Then you go back to studying and pick up where you left off. No harm, no foul. But when you’re dieting, all morning you ignore the donuts your roommate brought home. Eventually you give in and have “just one”. All that effort and you’re no better off than if you took one as soon as they showed up. So how do you keep your willpower out of the game? Don’t have donuts in the house. Don’t go grocery shopping when you’re hungry. If you’re going to have a snack, buy the small bag of chips instead of telling yourself you’ll only eat half of the big bag. I could keep going, but I’d just be making a list of all the things that trigger me to eat junk. You’ve got your own list. Figure out what’s on it, and how to avoid getting into those situations. And stop expecting your willpower to pick up the slack. I stopped worrying about bacon and ate it whenever I wanted to. I like bacon, but I’m not a freak about it, so we are talking 2-3 slices for breakfast 2-4 times a week. Two weeks later I was 6 pounds lighter.